Yesterday, as part of a column about the burden of regulation, I shared a couple of Christmas-themed videos, as well as a tragic story of Santa Claus getting arrested by the IRS. During previous Christmas seasons, there’s been other topical humor. This video showing how the North Pole would function if Obama had control. Another video, this one featuring Santa Claus griping about government red tape. The perfect present if you have any Timmy Geithner fans in your family. 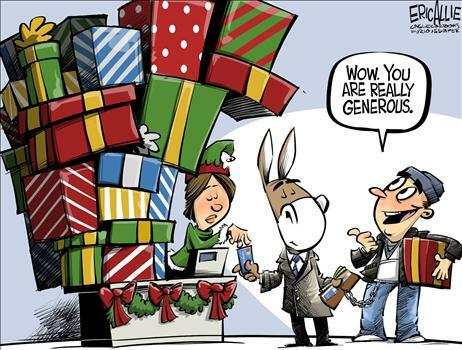 Cartoons showing what would happen if Obama replaced Santa Claus. There’s more, but let’s focus on augmenting our list with some new cartoons. 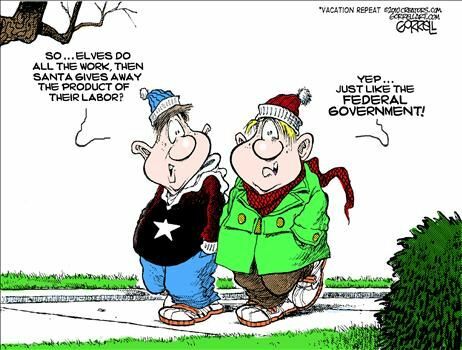 Here’s Robert Gorrell equating Christmas with the federal government. Very amusing, but I’ll defend Christmas for the simple reason that the whole thing is voluntary. Government redistribution, by contrast, is based on coercion. Which is sort of the theme of this Eric Allie cartoon. Though we need to remember that sometimes the statists bribe voters with their own money, but in other cases the statists buy votes from those who don’t pay any taxes (as illustrated by this Chuck Asay cartoon). 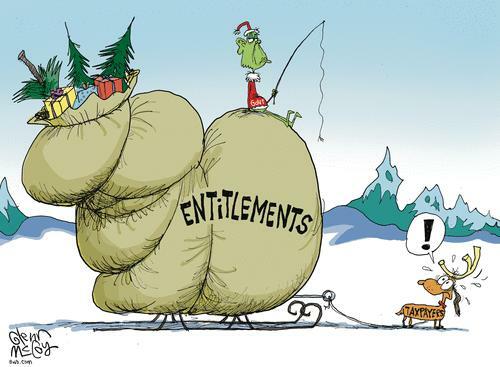 Next we have a contribution from Glenn McCoy that I find very appealing because it focuses on the ticking time bomb of poorly designed entitlement programs. Very similar to this Lisa Benson cartoon. Last but not least, let’s stop with the cartoons and try to answer the age-old question of whether Santa Claus is liberal or conservative. 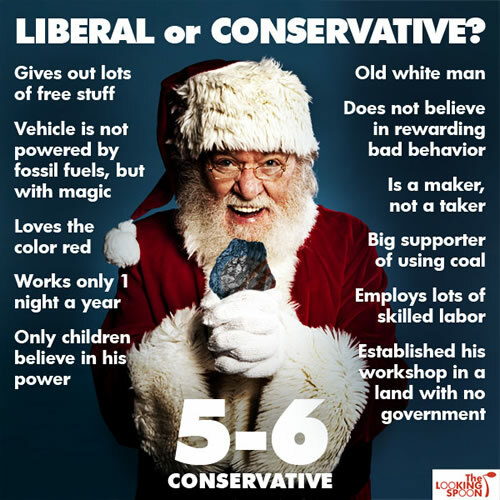 The person who put this together says Santa is a conservative by a 6-5 margin. Though the anarcho-capitalists may want to claim Santa since he’s from a land with no government. Here are videos about holiday travel and the TSA. Some Christmas satire, including Larry the Cable Guy’s politically correct Christmas Eve story. A heartwarming Christmas adoption story. My favorite Jay Leon joke. A politically correct holiday greeting.